Definition at line 85 of file util-mpm-ac.c. Definition at line 83 of file util-mpm-ac.c. Definition at line 84 of file util-mpm-ac.c. Definition at line 79 of file util-mpm-ac.c. Definition at line 81 of file util-mpm-ac.c. Definition at line 1167 of file util-mpm-ac.c. Definition at line 1192 of file util-mpm-ac.c. Definition at line 945 of file util-mpm-ac.c. 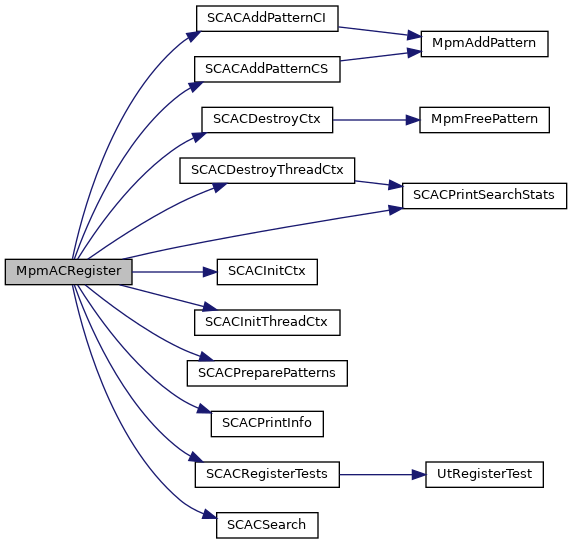 References SCACPatternList_::cs, MpmCtx_::ctx, MpmCtx_::init_hash, MpmCtx_::max_pat_id, MpmCtx_::memory_cnt, MpmCtx_::memory_size, MPM_INIT_HASH_SIZE, MpmFreePattern(), SCACCtx_::output_table, SCACCtx_::parray, MpmCtx_::pattern_cnt, SCACCtx_::pid_pat_list, SCACOutputTable_::pids, SC_AC_STATE_TYPE_U16, SC_AC_STATE_TYPE_U32, SCFree, SCACPatternList_::sids, SCACCtx_::state_count, SCACCtx_::state_table_u16, and SCACCtx_::state_table_u32. Definition at line 926 of file util-mpm-ac.c. References MpmThreadCtx_::ctx, MpmThreadCtx_::memory_cnt, MpmThreadCtx_::memory_size, SCACPrintSearchStats(), and SCFree. Definition at line 892 of file util-mpm-ac.c. Definition at line 872 of file util-mpm-ac.c. Definition at line 774 of file util-mpm-ac.c. References SCACPatternList_::cs, MpmCtx_::ctx, SCACPatternList_::depth, MpmPattern_::depth, MpmPattern_::flags, MpmPattern_::id, MpmCtx_::init_hash, MpmPattern_::len, MpmCtx_::max_pat_id, MpmCtx_::memory_cnt, MpmCtx_::memory_size, MPM_INIT_HASH_SIZE, MPM_PATTERN_FLAG_NOCASE, MpmFreePattern(), MpmPattern_::next, SCACPatternList_::offset, MpmPattern_::offset, MpmPattern_::original_pat, SCACCtx_::parray, SCACPatternList_::patlen, MpmCtx_::pattern_cnt, SCACCtx_::pattern_id_bitarray_size, SCACCtx_::pid_pat_list, SC_ERR_MEM_ALLOC, SCFree, SCLogDebug, SCLogError, SCMalloc, SCACPatternList_::sids, MpmPattern_::sids, SCACPatternList_::sids_size, MpmPattern_::sids_size, and SCACCtx_::single_state_size. Definition at line 1212 of file util-mpm-ac.c. References MpmCtx_::ctx, MpmCtx_::maxlen, MpmCtx_::memory_cnt, MpmCtx_::memory_size, MpmCtx_::minlen, MpmCtx_::pattern_cnt, and SCACCtx_::state_count. Definition at line 1199 of file util-mpm-ac.c. References MpmThreadCtx_::ctx, SCACThreadCtx_::total_calls, and SCACThreadCtx_::total_matches. Referenced by MpmACRegister(), and SCACDestroyThreadCtx(). Definition at line 2285 of file util-mpm-ac.c. Definition at line 1029 of file util-mpm-ac.c. References AC_CASE_MASK, AC_PID_MASK, SCACPatternList_::cs, MpmCtx_::ctx, SCACPatternList_::depth, SCACOutputTable_::no_of_entries, SCACPatternList_::offset, offset, SCACCtx_::output_table, SCACPatternList_::patlen, SCACCtx_::pattern_id_bitarray_size, SCACCtx_::pid_pat_list, SCACOutputTable_::pids, SC_AC_STATE_TYPE_U16, SC_AC_STATE_TYPE_U32, SCMemcmp, SCACPatternList_::sids, SCACPatternList_::sids_size, SCACCtx_::state_count, SCACCtx_::state_table_u16, SCACCtx_::state_table_u32, and u8_tolower.